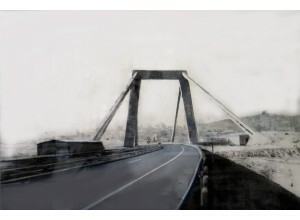 Bridge over the Tiber - coal gouache on paper, 2006. 76 x 112 cm Sold with a wooden frame. Museos Vaticanos - watercolor and ink on paper by Joaquín Míllan. 27.5 x 37.5 cm Sold with a wooden frame of 45.5 x 55.5 cm.